The United States of America (USA), on Wednesday urged the Government of Nigeria, to work out a lasting solution to the lingering Academic Staff Union of Universities (ASUU) strike even as it decried the activities of touts who deceive Nigerian students intending to study in the US, labeling them as criminals. “That is something for the Nigerian government. It is up to it to work it out with the striking lecturers. “We are not involved in that negotiation but we can encourage it. It is a fear, it is a worry for us because that would make it hard for the students to come. “It may be difficult, but there is no magic wand to resolve the strike,” Strassberger said. Also, the Head, Education USA, Jennifer Onyukwu, equally stated that the US has been concerned about the ongoing strike in so many ways. For instance, she noted that Nigerians who are seeking admission into US schools, require their transcripts which they cannot get because of the strike. “There is that concern because generally, the world has become a global village, people want stronger applicants in their campuses; so they want stronger senders,” she stressed. On patronising touts to study in the US, Strassberger enjoined admission seekers to access free information which is available at all time. “Those are the touts, those are the people that I will even call criminals because they are stealing opportunities by selling only documents by giving bad information and creating a disappointment when the person comes in with that information or with only document. And that is the result of not getting accurate information,” he said. Onyukwu said Nigeria has been US’s largest sender of African students from sub-saharan Africa to the US. “In the past six years, the US has spent over $40 million on scholarships and financial aid for undergraduate and graduate students, the US is expecting to do more in the coming year,” she assured. 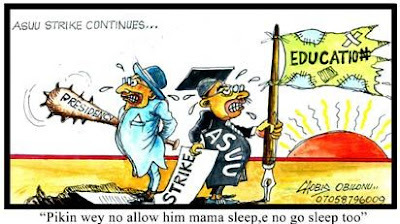 It would be recalled that, just last week, in addition to pulling out of negotiations with the Federal Government, ASUU had gone ahead to give reasons why it must continue the strike. It had also insisted that the Federal Government has to go ahead and implement the 2009 agreement it reached with them before it will consider calling off its current industrial action.